I was delighted when Sierra Club Books accepted my proposal to write Painting in Nature--it meant I could get out and paint en plein air, and not only COULD, but had to. A kick out the door was all I needed. I painted every day for months--it was wonderful! 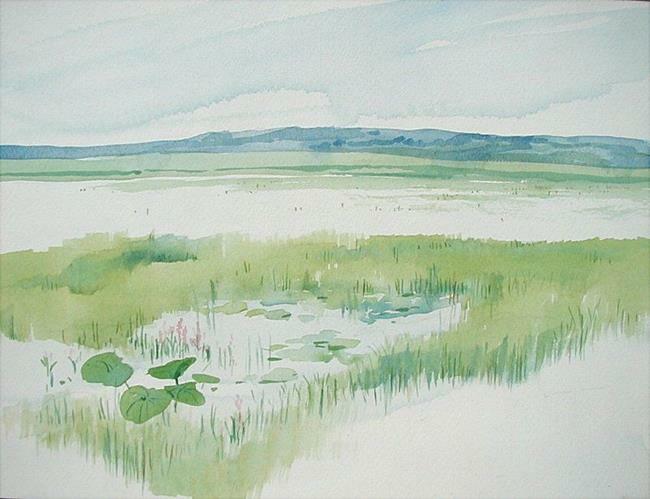 This was one of my favorite paintings from that period, in one of my favorite places, an old oxbow lake beside the Missouri River, and often a stopping ground on the Midwestern Flyway. Canada and snow geese, all kinds of ducks, and a variety of other waterfowl abound. The blue hills in the distance are all that remain of the glacier that left them there--they are now the bluffs that contain the Missouri River floodplain. A beautiful, peaceful place now under the supervision of the Missouri Department of Conservation. This day, there was a soft overcast, and a rainstorm building on the far horizon...the water looked almost white. I was very happy with the nearly Oriental simplicity of the resulting painting.